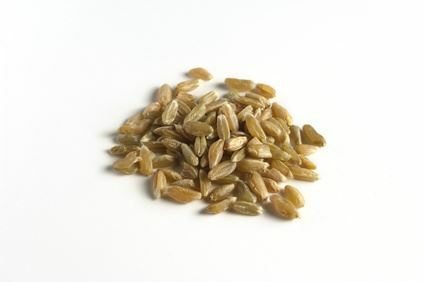 Green spelt is spelt that has been harvested when half ripe and then artificially dried, traditionally over a beechwood fire. The first preparation of green spelt was rather accidental and perforce: Several centuries ago, in response to periods of adverse weather, which destroyed crops, when it become obvious that another crop would be lost, some southern German farmers decided to harvest the spelt before it was completely ripe, and to dry it over fire. Because the dried kernels exhibited a pleasing flavour when cooked in water, it became traditional to harvest a portion of the spelt crop while still green. Due to the special drying procedure at up to 150 °C, green spelt has a specific delicious taste and ideally an olive-green colour. Green spelt contains many carbon hydrates, protein, fibre and mineral nutrients such as phosphorus, magnesium, potassium and iron.